I have a notebook that I keep with my bible so I can write notes or write down anything that I think is important, I also use colour coded pencils to read and understand it in more depth. One of the days when I was reading the book of Matthew I came across something that made me stop and think. It was a little home truth moment that I have been thinking about a lot again this week. For me it is a very challenging verse that makes me stop and think. 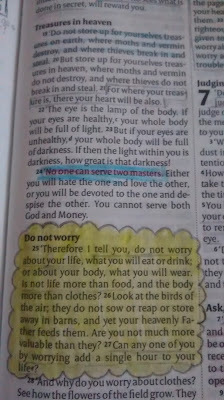 That verse is Matthew 6:24 (the bit colored in blue on the photo) This little paragraph, more specifically the blue bit, has been a real challenge to me these past few days. When i came across this verse a while back I was also going through a difficult time with my eating disorder but when I came across this verse I came to a rather brutal conclusion that I have been struggling to accept once again these past few weeks. I wanted to take a photo of my notes but there is a few other things on that page that I'm not wiling to share so I'm going to write out what I wrote then. I can't have my E.D (eating disorder) and God. I can't hold them at equal value. My E.D will only cause me pain. I can't serve God and my E.D. I have to chose and I have to stick to that choice. At the end of the day God loves me and my eating disorder will only cause me pain. Like I said earlier, I don't know loads about the bible. I can't break apart that verses, analyze it and the go out on the streets and preach about it. But what I do know is that God loves me. Some days I can't seem to accept that but at the end of the day the fact is God loves me and I can not serve two masters. Currently in my life I have my eating disorder and I have God. Being honest I would say that I spend more time thinking about my eating disorder than I do about God. THIS IS NOT OK. That verse is painful for me because for me it blatantly says I have to chose between God and my eating disorder. It's not a decision that I ever wanted to make. Maybe I'm reading it wrong but fr me that is what it says. 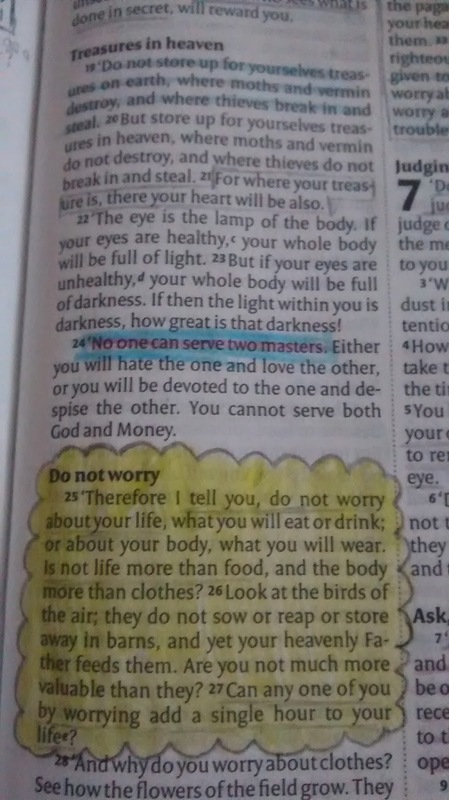 I know at the end of the verse it talks about money, but I don't care for money. Currently as a teenager money does not consume my life but what consuming my life is my eating disorder. So in my eyes I could use the same principle and idea for my eating disorder. By choosing God it does not mean that my eating disorder will go in a flash. It does mean however, that I can learn to trust God. It's going to be so difficult but over time I can learn to view myself how God sees me. It really will be a challenge but one day I might get there. I can't serve two masters. I'm making the decision to serve God.